I remember one day when I looked up there and saw what He done for me, I crawled humbly to Him. There laid my name on top of a book, and, oh, what was written under it. I said, "Lord, will you forgive me?" And seemingly, He took His hands, dipped into His side, and said, "Yes." 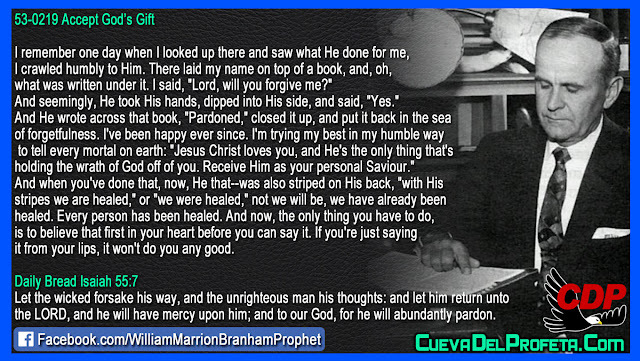 And He wrote across that book, "Pardoned," closed it up, and put it back in the sea of forgetfulness. I've been happy ever since. I'm trying my best in my humble way to tell every mortal on earth: "Jesus Christ loves you, and He's the only thing that's holding the wrath of God off of you. Receive Him as your personal Saviour." And when you've done that, now, He that--was also striped on His back, "with His stripes we are healed," or "we were healed," not we will be, we have already been healed. Every person has been healed. And now, the only thing you have to do, is to believe that first in your heart before you can say it. If you're just saying it from your lips, it won't do you any good.